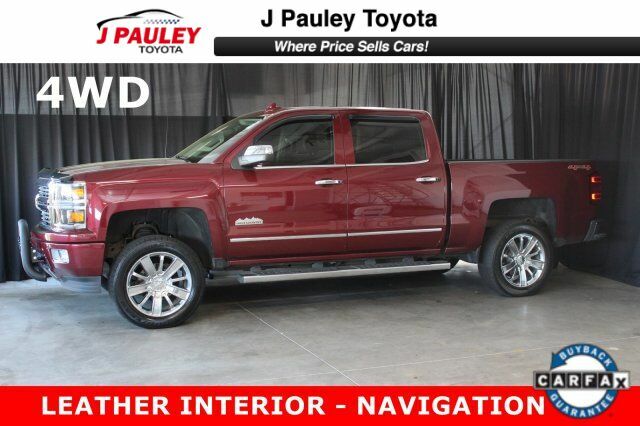 This 2015 Chevrolet Silverado 1500 High Country comes equipped with these options: 4 wheel drive, exterior side steps, tow hitch, premium alloy wheels, power locks, power windows, leather interior, memory set driver's seat, power adjusting front seats, AM/FM radio, CD player, AUX input, USB port, multiple power sources, GPS navigation, backup camera, heated/cooled front seats, lane departure warning, parking sonar, cruise control, heated steering wheel, and keyless entry. Stop by and visit us at J. Pauley Toyota-Scion, 6200 S 36Th St, Fort Smith, AR 72908. DRIVER ALERT PACKAGE (Includes Lane Departure Warning, Forward Collision Alert, and Safety Alert Seat.